Picture Window Books (a division of Capstone) proudly released the first six books in the "DC Super-Pets!" series in January. I was lucky enough to receive all six books: The Fastest Pet on Earth , Heroes of the High Seas , Midway Monkey Madness , Pooches of Power! , Royal Rodent Rescue , and Super Hero Splash Down . The books are a lot of fun. The each begin with a profile page of the main Super Pet featured in the book, outlining the character's particular super powers or gadgets. The page also gives a brief background origin story and who their superhero owner is. A three chapter story is the main content of the book. While the stories are simplistic and obviously aimed at young children under the age of 10, the illustrations are colorful and full of energy. While the story focuses on one particular super-pet, they're usually joined by other super-pets or super-friends. For example, Beppo the Super Monkey is joined by Zan, Jayne and Gleek to battle Gorilla Grodd. Ace the Bat-Hound is joined by Krypto the Super Dog to take on Penguin's Bad News Birds. The Super-Pet's owners do sometimes make cameo appearances, but the books aren't about them, the focus is definitely on the Super-Pets themselves. Each book finishes with the same two-page spread showcasing all the Super-Pets and Super-Villain-Pets featured in the series. Forty four in total... Twenty two of each. The books also contain a jokes page, and a "Word Power" page which gives the definition of some of the harder words found in the story. Finally the books close out with a bio on both the writer and artist of that particular book. All six books in the original release are illustrated by Eisner Award-winner Art Baltazar. The writing duties are shared between Sarah Hines Stephens, John Sazaklis, Jane Mason, and J.E. Bright. 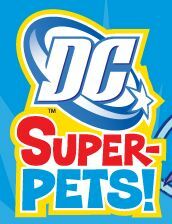 Anyone looking to introduce their young child to the world of superheroes could do a lot worse than pick up the initial six-book run of the new "DC Super-Pets!" series.